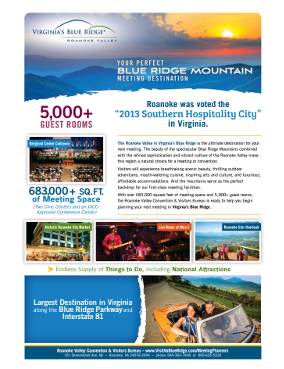 Take advantage of these digital brochures to help you plan your meeting in the Roanoke Valley in Virginia&apos;s Blue Ridge. We&apos;ve put together relevant resources about the region that help provide meeting attendees with resources about activities, general information about Virginia&apos;s Blue Ridge, and the types of services we offer meeting planners. The following brochures and profile sheets can be downloaded and printed, providing great information about the Roanoke Valley. Visit Virginia&apos;s Blue Ridge also has a variety of helpful maps to assist you in navigating around Virginia&apos;s Blue Ridge, including regional maps and dining/shopping maps of Downtown Roanoke. You can also utilize the breathtaking destination video for Virginia&apos;s Blue Ridge, which highlights many of the unique metro mountain experiences of the region.